Run by the STM, Montreal's public transit corporation, Montreal Airport Bus the 747 Express launched on March 29, 2010, set in place to accommodate a growing need for affordable transportation between downtown Montreal and the Montreal-Trudeau Airport. Where Do I Catch the Montreal Airport Bus? Check the map of the 747 Express Route detailing ALL of the bus stops (scroll down to see map). Note that the 747 stops near various hotels and tourist attractions. When Can I Catch the Montreal Airport Bus? En route 365 days a year and 24 hours a day including late at night, the 747 runs from every 10 minutes or less during the day to every hour in the middle of the night. Consult the 747 Express Bus schedule. Though it could theoretically take as little as 20 minutes outside of rush hour, expect the 747 Express to take 45 to 60 minutes from the Berri-UQAM bus station to Montreal-Trudeau Airport and vice versa, just to be on the safe side. You can buy a pass in advance at the Montreal-Trudeau Airport International Arrivals level or pay in exact change on the bus (no dollar bills accepted). You can also purchase passes at any Montreal Metro station, by credit card through any of Stationnement de Montréal's street parking pay stations and at the tourist centers at Dorchester Square, in Old Montreal as well as at Montreal's Central Bus Station (i.e., Centre d'Autocars de Montréal). I'm a Montreal Resident. 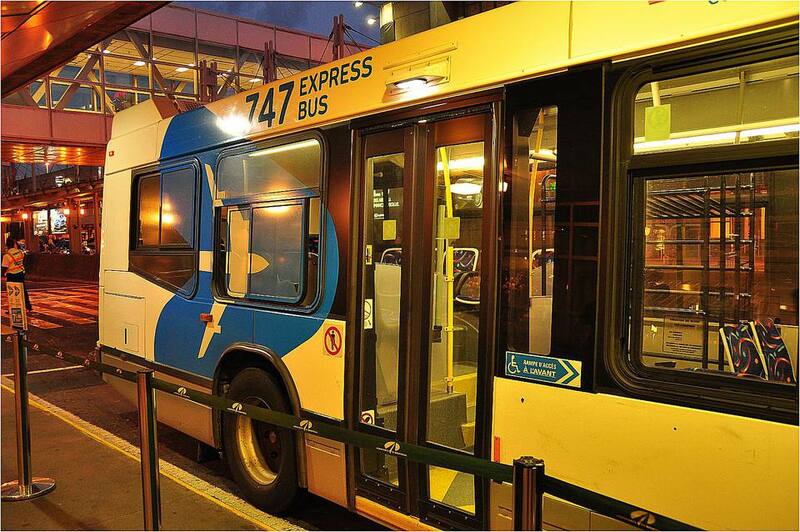 Can I Use the 747 Express Bus Like Any Other City Bus? Yes, you can. One of the reasons this bus line was launched in the first place was to allow airport employees an easy, affordable way to get to work. As long as you pay the $10 per use charge OR show your monthly, weekly, one-day or three-day transit pass, you can hop on the 747.